Transverse electromagnetic (TEM) is a mode of propagation where the electric and magnetic field lines are all restricted to directions normal (transverse) to the direction of propagation. Plane waves are TEM, however, we are more interested in what types of transmission lines can support TEM. There is plenty of information on the worldwide web about TEM versus non-TEM, some good, some bad. We aim to appeal to the lowest common denominator. But we invite everyone to comment on this subject, especially if you think we are in error! College textbooks start by explaining how Maxwell's equations can be used to derive conditions of TEM propagation. If someone wants to explain this in their own words, be our guest! Benefits of TEM is that the media is non-dispersive, that is, the phase velocity and characteristic impedance are constant over a wide band (at least until other "spurious" modes start to propagate). Can someone send us some images of spurious modes in your favorite transmission line media? TEM mode is the preferred mode in coax. Under proper conditions, all E-field lines run radially, while magnetic field lines run in circles around the center conductor. Stripline, ideally, offers TEM mode. Parallel plate waveguide also supports TEM. One of the conditions for TEM mode is that all of the field lines exist within a homogeneous medium. This is usually true for coax and stripline, but not always. Coax can have multiple dielectrics. Stripline often uses two different dielectric materials; in these cases, true TEM is not achieved. Actually, in no physical case is pure TEM acheived, but don't get depressed about this, we can come close! 1. Fields are contained in uniform, isotropic dielectric material (excludes microstrip). For TEM, there is never a calculation of Keffective needed! 3. The conductors must have infinite conductivity. The IR drop across the conductor bends the E-field ever so slightly going forward. 4. The dielectric must be lossless. Conditions (3) and (4) make it impossible to create pure TEM unless you have access to superconductors and a zero-gravity lab so you don't have to support the conductors. But these rules are splitting hairs and can usually be ignored in real life. Stripline provides near-TEM mode so long as it obeys the above first two rules. Let's just forget about the third and fourth rules, OK? In the figure below, the transverse directions are shown. One of these days we'll get artistic and try to draw the field lines, magnetic fields encircle the strip conductor, and electric fields extend into/out of it at 90 degree angles, and terminate in the ground strips. Below, we will attempt to illustrate the non-TEM behavior of microstrip Buzz Lightyear's left arm represents one electric field line directly above the microstrip conductor; his wings represent one of the magnetic field lines. As the wave propagates down the line (starting from pure TEM as it was launched by an ideal coax connector not shown), the dielectric constant in the substrate slows the wave down, compared to the field lines in air. Thus the fields lines tend to bend forward (into the TEM-forbidden longitudinal direction. Microstrip is referred to as quasi-TEM. This is because the static (DC, or zero frequency) fields are transverse electromagnetic. So, when can microstrip provide TEM transmission? Here's three cases: If the "substrate" is air, then the fields will propagate uniformly. But you will have to figure out how to suspend the strip conductor somehow, which is going to take a material that will slightly perturb the "TEM-ness". And last, at infinite frequency, the entire wave is contained in the substrate. Too bad infinite frequency is way outside of the microwave spectrum, and the media will support who-knows-what different modes when the thickness is infinite wavelengths. Update for September 2010... looks like we got what we wished for. We have plenty of new images to illustrate the TEM and non-TEM modes. Below we've posted two movies on quasi-TEM behavior of microstrip; click on them! Contributed by Laila, thanks! Since my field of work is in Electromagnetics and Antenna design, it was of our interest to provide your website with some images regarding the Electric Field Distribution (Magnitude & Vector) along an excited 50 ohm microstrip line terminated with matched load. 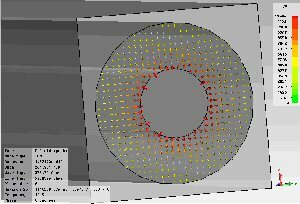 This design was simulated using Ansoft HFSS v12. There's more information coming soon. Here is an approximate 3.5 mm connector with diameters of 3.5 mm outer conductor and 1.5 mm inner conductor. Never mind the square outer conductor; it just makes it easier to simulate. The first few modes are solved across the face of the coax. The dominant mode is TEM. The E field is radial and the H field is circular. Impedance is 51 Ohms. Click on them to zoom in.